ready to help you create the event of your dreams. Evans Sales Solutions will serve as a partner in promoting Tuxedo Junction, Inc., who answers the call of the best dressed men across America. The team of Evans Sales Solutions owned & operated by Chris & Rebekah Evans, bring experience from an extensive 30-year background in the wedding industry with business, marketing, trade show promotion, with an added plus-stemming from the ‘chamber of commerce field.’ In this new role as the ‘Bridal Marketing Concierge,’ for Tuxedo Junction, Inc., the Evans Sales Solutions team will identify market needs and support the outreach for this top Tuxedo & Formalwear Company. 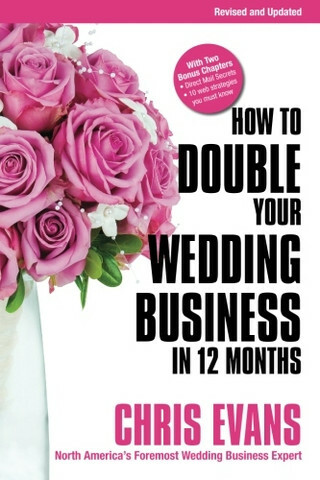 Evans, author, top wedding industry speaker & sales business trainer, produces the Nationally known ‘Bridal Business Boot Camps’ live workshops which Inform, Inspire, and Empower those in the wedding industry to think differently about their work, and to walk away with an “I can do this” attitude! As a leader in the wedding business, Chris has literally taught thousands of wedding professionals to grow their business and improve their results while entertaining them in the process. Rebekah Evans brings business savvy to the team as former President/CEO of the Malibu Chamber of Commerce and more. Serving the community, she implemented ‘hands-on’ business growth for those in the hospitality, business services, tourism and the wedding industries. Evans Sales Solutions, LLC is best known for their wedding industry and business growth training products and is a California corporation. 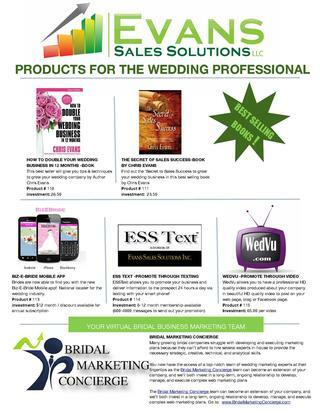 For more information on Evans Sales Solutions, LLC or Bridal Marketing Concierge and the full line of wedding industry professional support, please visit www.EvansSalesSolutions.com or call 805-322-4446. Time is money! Don’t get stuck spinning your wheels on things that can be done for you while you work or sleep. Auto Responders When people sign up to get email updates from your business, you can use an auto responder to make sure they don’t fall through the cracks. An auto responder allows you to enter a series of newsletters or informational snippets and delivers them via email in the order and schedule you choose. So after a bridal trade show, when you have tons of new contacts, enter the email addresses and the auto responder will take it from there. A good one to check out is aweber.com. Delegation What is the task that you don’t do well? Hate writing email blasts? Hate entering data? Or designing brochures? Delegate it to someone who does like the job and does it well. It will get done faster and turn out better than if you forced yourself to do it. Go to elance.com to see what I’m talking about. Next time you’re sitting at your desk forcing yourself to get that dreaded task done, start thinking creatively. Look to the virtual world to get more done. Check out our ESSText program to discover another way you can promote your business 24 hours a day through automation. And remember you can’t always do everything yourself, so work smarter this week. Automate and delegate.